The poster promises a different film than the one we get. There is something wonderfully subversive about the poster that is missing from the film itself. 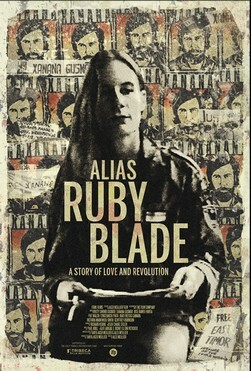 This is the story of Kirsty Sword Gusmao who grew up in Australia in the 1970's and 80's and then through circumstances found herself first acting as a journalist covering the Indonesian oppression of East Timor before becoming an important part of the resistence (Ruby Blade is her code name) and eventually falling in love and marrying Kay Rala Xanana Gusmao the head of the resistance and the eventual Prime Minister of the country. For me this is a good film but not a great one. As I said is the film seems to be rather bloodless. . We never get a sense of the cost, real or possible for her, The tensest moments come when after the vote for independence goes against Indonesia and the militias begin to head toward the UN compound. Here at last is a sense of danger and cost that is missing from the rest of the film. Kirsty is of course somewhere else when it's all happening but at last we get a sense of the cost of the fighting for at least the people she's helping. This is an okay film that is little more than a love letter to it's subject and a superficial primer on the larger subject of East Timor and Indonesian misdeeds.